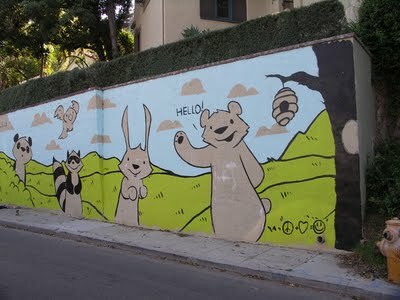 I'm a lil fuzzy on it myself but, I painted that in a residential neighborhood as a commission. And for the last year it has been riding high, but for some reason one of the neighbors decided to call the city about it to complain. And I guess the deal is you can't have a mural on private residential property or some bs like that. I guess it's on the same guide lines as shop keepers maintaining a clean facade with no graffiti. But it's pretty stupid because from what I understand is that pretty much everyone loves that mural except for that one person that called it in and to top it off it is right next door to a preschool. So no the kids are missing out. Oh and get this to even try a petition to keep the wall you have to pay like $1500 or some obscene amount so the city could even consider not taking it down. The artist's outrage is completely understandable. Many people in L.A., myself included, would like to see more murals and artistic expression and less commercial advertising in our public spaces. Unfortunately, murals have gotten tangled up in legal issues involving billboards and supergraphic signs, and at the moment there's no clear answer. For a little history, the city began requiring permits for murals some time ago because of some issues that arose from any lack of regulation (which may or may not have been legitimate, according to one's point of view) When the city banned off-site signs in 2002, some sign companies started claiming that the city would also have to ban murals. To address this, the city allowed murals as signs painted to walls, etc. with a very small percentage of the sign devoted to text of a very limited size. Sign companies then put up huge supergraphics with just a Nike or Apple image and claimed they were legally murals. This all got drawn into the courts, of course, and the city decided to suspend issuing any new permits for murals while it rewrote its sign ordinance to try to make murals immune from the sign company legal shenanigans. Then a federal judge declared the off-site sign ban unconstitutional, and everything was put on hold pending the outcome of an appeal, which is expected some time this year. I don't know what happened in the specific case of the mural at issue here, but if someone complained (and that could have been a sign company person)the building department would have no choice but to cite it. And not to defend the city, which has done a poor job of enforcing sign regulations for many years, it has cited a lot of illegal billboards and supergraphics but the companies have been able to stop further action through the courts. The artist who has in good faith painted a mural has no resources to do the same, of course. thank you for the comment Dennis. I must say it is a sad state of affairs when the public cannot curate its own spaces because advertising has created such a mess. This is indicative of why PublicAdCampaign wants to eliminate outdoor advertising entirely from our modern metropolis'. Too often advertising creates an environment which is not conducive to public use of public space be it by commodifying public spaces or creating an environment so rife with problems that the city must crack down on all visual communications in public spaces. "...slated for removal after a single resident complained about it...." about these happy, cute, and awesome bears /animals that that greets passerbys "HELLO" with big smiles? Has the officials in the City of Los Angeles lost thier minds? Are these friendly innocent looking animals something they do not want their kids to see in their streets that they want it removed right away because of one neighbor? I am sure there are other hundreds of people objecting to other murals in the city that are less friendly but instead promotes obscenities and violence that had been there for many months and perhaps years. I wonder what this one neighbor has to say about them? What is his motive/s? Is his intent to desensitize the good people of LA & their kids to obscenities and violence? Is he an American? Or is he one that wants to destroy americans and devalue their values of goodness, kindness, and happiness? I say to the puppet officials of the City of Los Angeles, have you lost your common sense ? Craziness.. I love the bears.. Kill the AdvertEyeSores..